How Does Energy Impact A Roofing Roofing Decision? Residential rooftops are too plentiful and too large of a component of any home investment not to be looked at as critical to a home’s energy performance. 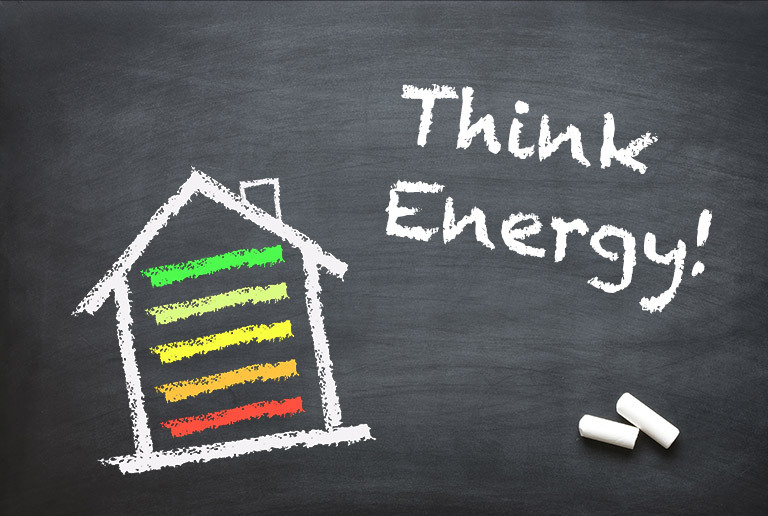 When you consider a new roof for your home, you think and talk about saving energy, harnessing energy, or both. Increasingly, this is something that is becoming government-mandated. The state of California recently passed regulation under which, effective in 2020, all new construction homes must include a solar collection installation. What’s more, many other states are also looking at similar regulations and undoubtedly will be making their announcements in coming the months and years. What is the best roofing material to support the existing and coming reality? The answers are two-fold: saving energy and harnessing energy. While much discussion can be given to “green” energy and its benefits, there is still one reality: the best way to impact the energy world is to reduce the need for energy. It is best to do all you can to reduce your home’s energy consumption before thinking about trying to harness energy through solar or other avenues. Metal roofing has many ways in which it saves energy, and these can all be a part of the “roofing and energy” thought process. Most of the metal used in roofing has high recycled content – as high as 95% or even more in the case of aluminum. The embodied energy in recycled metal is far, far less than the embodied energy in virgin metal. Metal roofing is long-lasting. With roofing materials that need to be replaced periodically, you’re always forced to go back to the “energy well” each time new materials have to be manufactured, shipped, and installed. The low weight of metal roofing allows more roofing to be shipped on a truck than the heavy shingle or tile products; delivering significant savings in the total energy consumed by a new roof. Quality metal roofs often have reflective pigments in their coatings, reflecting radiant heat away from the home. In the case of metal shingle metal roofs, there are often integrated airspaces between the metal and the roof deck. This air space acts as a thermal break, stopping the conductive transfer of heat from the roof surface to the structure; similar in many ways to double and triple pane windows. Metal roofs can be easily vented, helping to exhaust heat out of the attic space, further reducing air conditioning demand. Metal roofs are ideal for installation over insulated roof decks and conditioned attic spaces – they are not degraded by the inability of heat to pass through them. For traditional solar panel installations, metal offers a great base due to its durability. The life expectancy of solar panels is, at a minimum, 20 years. It does not make sense to install them on top of roofing that may need to be replaced sooner than that. If you’re roofing your home now and anticipate adding a solar installation in a few years, it may not be wise to add that solar installation down the road without re-roofing at the same time – unless you have a roof that is long-lasting and designed for solar. With some metal roofs, solar panels can be attached with minimal fasteners through the roof. With others, those fasteners and brackets can be easily sealed for long-term water tightness. The stability of metal over time allows long-term sealing in comparison to other roofing materials that dry out and deteriorate over time. Metal is recognized as a great substrate for “thin film” and other building-integrated solar collection methods. This is due to its stability and high strength – low weight ratio. While traditional PV panels still offer the most cost-effective option for homeowners, other options are increasingly available, and metal is present with most of them. We’re always ready to provide more useful information on roofing and energy, through our website, brands, or our resident expert on roofing and its impact on energy saving and harnessing, Todd Miller. Please feel free to contact us anytime to discuss your roofing or home remodeling questions. We also enjoy your calls at 1-800-543-8938. Considering Saving and Harnessing Energy With Your Roof? Our Roofing Needs Profiler includes several selection criteria based on energy and climate. In just 10 minutes, you can clarify your roofing needs, and begin your plan for energy management. Conductive Heat. 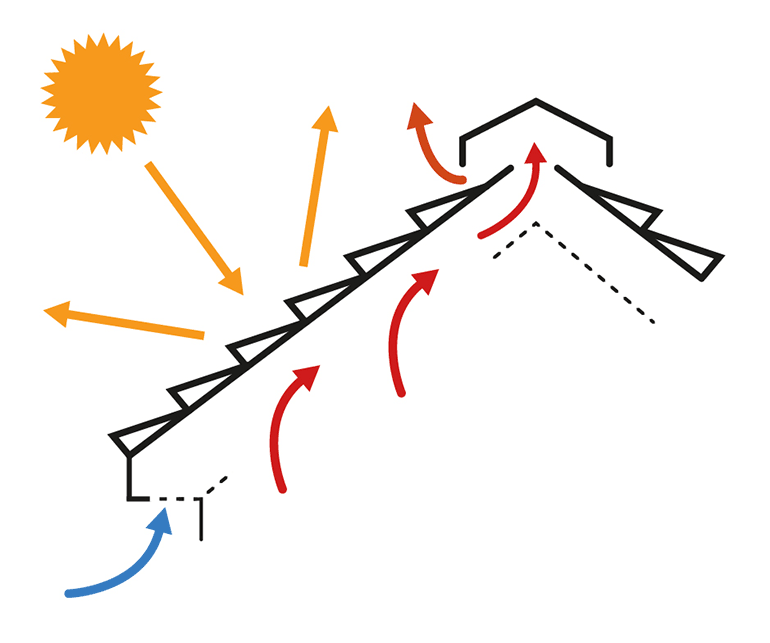 The integral airspace beneath metal shingles, and with certain installation procedures beneath our standing seam metal roof systems, stops conductive heat transfer from the rooftop down into the attic. Convective Heat. With Proper attic ventilation, convective heat flow in the attic moves any heat that is gained in the attic back to the outside through a drudge vent or other exhaust vents which can be a part of our metal roofing systems.